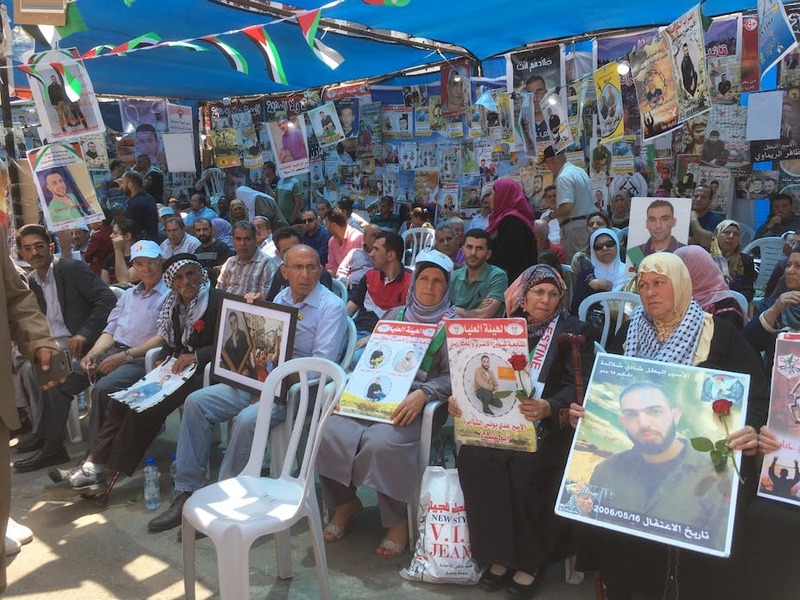 The longest mass hunger strike in Palestinian history has been suspended after 40 days. Lengthy negotiations with the Israel Prison Service (IPS) have yielded some concessions, including a second monthly family visit – to be funded by the Palestinian Authority – and limited access to public phones. The news was greeted with declarations of “victory” at press conferences at Yasser Arafat square in Ramallah, and with the Palestinian Prisoners’ Media Commitee claiming a “legendary triumph” for the strikers. The full details of the deal are as yet unclear, but regardless, it’s not before time. The strike began on April 17 in response to a call from imprisoned Fatah leader Marwan Barghouti, who was sentenced 15 years ago for his role in the Second Intifada. The strike saw more than 1,300 detainees in Israeli prisons refuse to eat for nearly six weeks. As their campaign wore on, more and more family members and supporters gathered to support them in “solidarity tents” throughout the West Bank and Gaza. I visited one such tent in Ramallah. Its blue tarpaulin walls were adorned with hundreds of photos of detainees, and about 150 relatives sat on plastic chairs clutching framed photos of their loved ones, eager to recount their stories. Among them were activists and ex-detainees, but also everyday people who had come to support prisoners they consider national heroes and recognise their courage. The atmosphere around the strike became intense, with clashes at checkpoints and throughout the West Bank; whole towns were paralysed, and roads leading to Israeli settlements blocked. This all took place against a background of protests and events commemorating 69 years since the Palestinian Exodus, or Nakba, and the forced displacement of Palestinians at the start of Israel’s occupation. Israel and the West Bank also recently hosted Donald Trump, who has declared that brokering peace between Israel and the Palestinians would be the “ultimate deal” but has not yet provided details of any plan. His visit triggered a Day of Rage among Palestinians. But for all the strike’s complexities, the prisoners’ demands were simple, and according to prisoners’ rights organisation Addameer, fully compliant with international human rights and humanitarian law. Ultimately, the prisoners who went on hunger strike were demanding better conditions and treatment, which at present are deplorable. Take the case of Mahmoud, a 25-year-old former prisoner I met who’s recently been released. In 2012, he was arrested in the middle of the night from his home in Aqabat refugee camp, near Jericho, for throwing stones at checkpoints. He was sentenced to five years in jail. His brother Sami was arrested shortly afterwards and served six years of administrative detention, a type of imprisonment where prisoners can be held indefinitely on the basis of secret information to which they have no access. Like many others, Sami was moved from prison to prison, meaning that his legal representatives could not locate him in time to request a visitor’s permit before he was moved again, despite being granted official access to him. Then there was the demand for family visits. Sami and Mahmoud’s sister, Hiba, told me how the number of visits allowed per month has been cut from two to one as the Red Cross, which organises many of these visits, faces funding cuts. Other mothers described being denied visits by the IPS for months on end. Visits are also hard simply because the prisons are in Israel rather than the Occupied Territories, meaning family members require formal permission even to travel to them. Hiba’s mother, like many of the women in the Ramallah tent, told of humiliating searches and endless queues lasting hours in extreme temperatures before being granted a meagre 45-minute conversation through a glass screen. Worse still, mothers are frequently turned away just as they reach the point of contact as they allegedly have insufficient proof of their relationship with their child. The strikers had more demands besides: greater access to legal services, better food, appropriate medical care and treatment, an end to solitary confinement, and crucially, the use of public telephones. The latter would mean prisoners no longer had to communicate with their families via messages on phone-in shows and requests on local activist radio stations such as al-Huriya or Asra Voice. For a time, the strike seemed to be at a deadlock. The IPS resorted to repressive measures, putting strikers in solitary confinement, confiscating most of their clothes and their radios, and subjecting them to obligatory random headcounts throughout the day. Before the deal was done, Gilad Erdan, Israel’s minister of public security, called the prisoners’ demands “over the top” and maintained that Israel will never give in to “extortion”. But his words, it seems, were hollow. As the days wore on, with prisoners being hospitalised as their physical condition deteriorated, it was hard to imagine the campaign ending well for either side. The IPS duly agreed to negotiate with prisoners on improving conditions, and the deal now being celebrated was struck. Within the Occupied Palestinian Territories, the hunger strikers are heroes. Before the deal was done, groups of high school children were being brought to the solidarity tents to sing in tribute to their bravery and resilience. And at last, a breakthrough that once seemed impossible has been made. Note: this piece was published just before the hunger strike was suspended. It has been updated to reflect the latest developments. Here's my vlog on my British Academy-funded project - This gives you an overview of what I am doing. My next vlog, which is coming shortly, will give you some insight into my initial findings. So, there I was outside my examiners’ door having successfully defended my thesis. I had apparently made my “contribution to knowledge” and now had to start on the arduous task of gaining seemingly-illusory academic employment in the Humanities. Gone were those comforting and supportive monthly supervision sessions when my blatant and embarrassing academic misdemeanours were gently corrected. It was now up to me to prove, or hope, that my credentials would stack up and afford me a serious chance of getting a full-time and permanent position. My studies were interdisciplinary – surely that must be good – comprising a couple of languages, international relations, conflict-studies, terrorism… The world would be my oyster. But not necessarily, given the fierce competition for every job and the fact that, as those who check jobs.ac.uk every week will have noticed, the number of PhD studentships being advertised often outstrips the number of permanent positions up for grabs in the same areas. Yet, it’s possible. I, and all my cohort, have managed to get academic positions. I am now a full-time, permanent lecturer at the Modern University of the Year with every opportunity being thrown at me. Suddenly, I am supervising students and handing out the same advice I had been given and did not quite grasp just a few years earlier. How to prepare for an academic career? What would I suggest? Preparation for classes is key. Imagine a room full of students, itching to check their phones, staring at you when you’ve run out of material early. Answer emails “by return”. Students are clients now. Do not ever expect to have time off again. The concept of a lecturer’s long summer holiday is a fallacy. You spend your term time preparing for classes so the only time you get to do the thing you actually like – your research – will be weekends and teaching breaks. Don’t bother working out how to book holidays on the university’s impenetrable computer system. Yes, the permanent threat of job cuts hangs over us all and pay in the public sector is never going to rival that of the private sector. The outside world’s stereotypical image of an academic drifting in to teach one or two classes with lengthy holidays is far from the case. “REF” is the buzzword and everything is about Q1 articles and funding. But what better job is there? Mental stimulation in the area of your choice with genuinely interested and interesting people and the freedom to pursue the research of your choice? Since I was awarded my PhD in summer 2014, I have gained a job, got a book contract with Routledge and been awarded British Academy funding for my research. Find that job, don’t be choosy – a job is a job and may lead to better ones. Seize every opportunity you are given and believe in yourself. It’s a competitive world out there but the capable can do it!